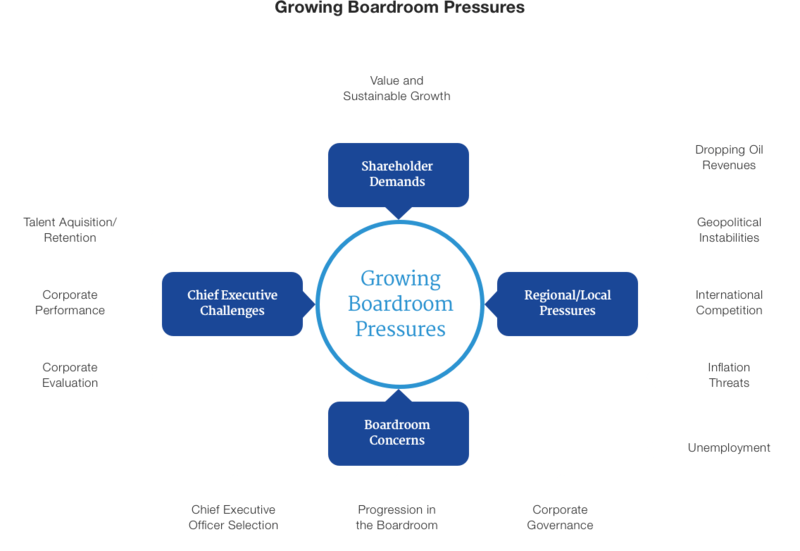 In today’s world, boards play a key role in the successful oversight and productivity of an organization. The identification and appointment of new board members begins this process, but ongoing and diligent attention to board assessment plays a critical role in long term success. Strong boards recognize that self-assessment and management are some of the most crucial aspects of effectiveness. Organizations thrive when their boards thrive. It is the role of the Board of Directors to continually reflect on its own process and develop strategies to become more effective. The business landscape and economy have changed dramatically in recent years. Strong international competition, dropping legal and cultural entry barriers, rising geopolitical instability, the growth in unemployment, and the collapse of historical monopolistic practices – all of these elements indicate that any board that chooses to ignore these changes or elects a “proactive wait and see strategy” is simply being unrealistic. Proactive, ongoing board assessment is an essential component for any business model. The Stanton Chase Board Assessment team partners with small, mid-sized, and large organizations to assess and strengthen your board. Leadership : Sets the performance tone and culture of the organization. The far-reaching benefits of ongoing, robust executive assessment are a game-changer in today’s competitive business environment, and the Stanton Chase board assessment team is prepared to bring your board and to the next level. 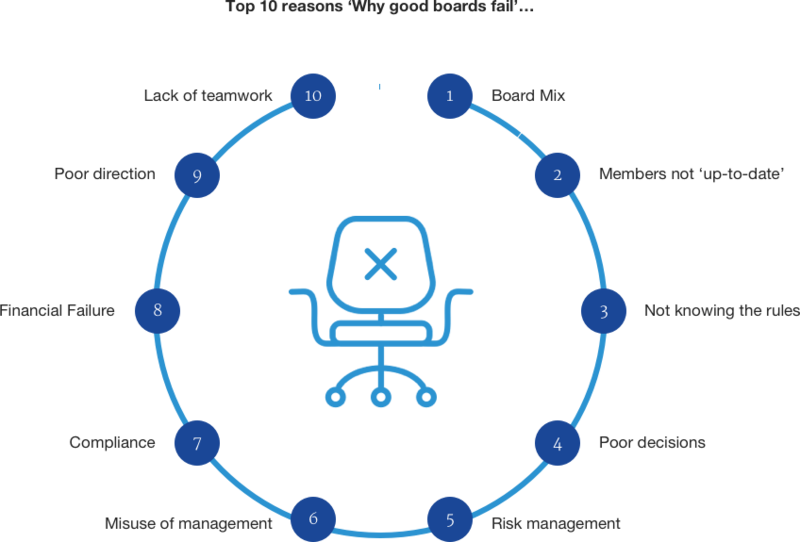 Our Stanton Chase Board Assessment team has identified the top ten major obstacles in board development. At Stanton Chase, we aim to avoid these pitfalls, and we partner with your business leaders to strategize and implement best practices in ongoing board assessment. To read more of our leadership insights on this topic, download our Stanton Chase white paper “Why Good Boards Fail”. The Stanton Chase Board Assessment Team looks to the future. Our professionally trained assessors identify the current strengths and weaknesses of a board, and they match these to future growth opportunities. This future-based approach allows organizations to stay ahead of the curve. In the present economy, we see a number of increasing pressures facing boards. We recognize these pressures in today’s international business landscape, and we maintain a laser focus on future opportunities and development for each unique organization. In line with our orientation to the future, we maintain a growth focused approach to board assessment. We take a multidimensional view of growth; namely, we do not solely focus on adding board seats, but we look at how to grow and develop your individual board leaders. We take into account your current board composition, your organizational mission, and resources available, among many other factors. To achieve successful growth, our Stanton Chase Board Assessment team uses a variety of tools. The right tools, used well, contribute toward a smooth, swift and insightful experience. 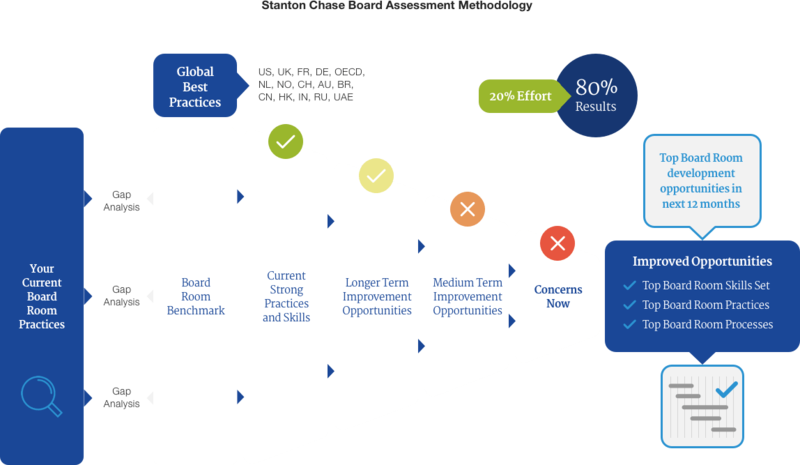 Tools are matched to a board’s maturity and experience and allow the rapid but accurate and complete identification of both a board’s strengths and its opportunities for improvement. Using our Board Assessment Methodology and Board Assessment Tools, we take a quantitative and qualitative approach to identifying strengths and areas for development and growth on your Board. Our proprietary tools lead to an assessment that will benefit your organizational growth in the short and long term. We deliver individual, honest, and actionable feedback for your leaders. Our Stanton Chase Board Assessment Team consists of experienced, professional and trained executive assessment facilitators. In addition to our years of proven, trusted partnerships, Stanton Chase is a member of the Association of Executive Search and Leadership Consultants which means that we adhere to the AESC Code of Professional Practice. Our world-renowned reputation is based on decades of demonstrated integrity and trust. Contact your nearest Stanton Chase Board Assessment consultant to learn more about how we can strengthen your board for the next generation.